Hi ya'll. On this dreary day in Ohio, and a Monday to boot, I thought there could be nothing better than a little freebie linky party! So I'm linking up with Classroom Freebies for their Manic Monday linky party! My first freebie I actually just went over with my kiddos this past week. We have been talking about all the different comma rules. Commas can be CONFUSING for 4th graders. Honestly, I was just happy when I got them to stop calling apostrophes commas! I know ya'll can relate :) Now, we're on to learning 6 basic comma rules. I know I know, there are PLENTY more! But these are the ones that I am requiring my little yahoo's brains to wrap around and master for now. Before we started this lesson, I actually had my students do a mini "comma hunt." I had them look through their book they are reading with me during Daily 5, and make up 3 comma rules on their own. They had to use evidence from their book to support this, and give 3 examples of this rule being used in their book. Ex: If they saw that their author used a comma after all LY words, their rule would be "Use a comma after an ly word in the beginning of a sentence." Then they would have to give me 3 examples of this from their text. The next day I went through the first 3 rules with the kiddos. We took notes, and I displayed the rules on the border. I printed these out, laminated them, and they now hang in our writing center. They are part of this freebie pack! The second day we went through the next 3 rules. I had the kids have their own rules out, and we checked to see how many of them got some of the rules correct. I was surprised how many did! 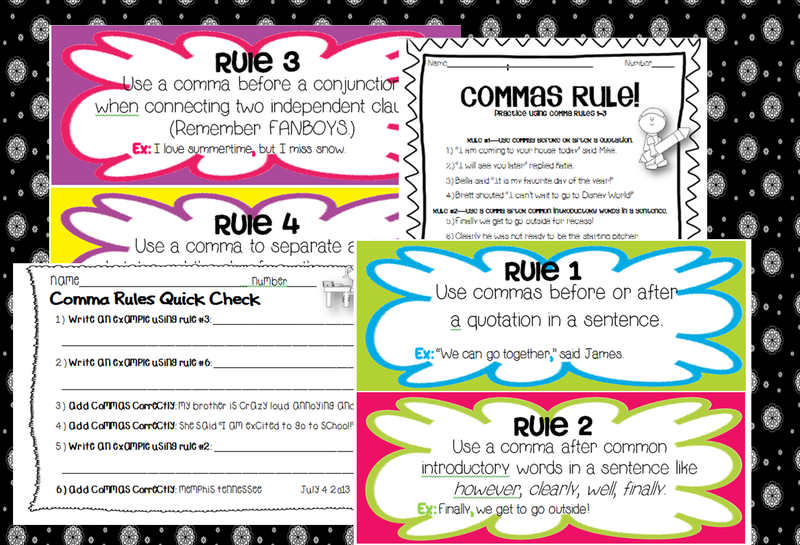 I then made one of their stations the 4-5 pages in the freebie document, where they had to practice each rule using editing marks. They did a WONDERFUL job with this! Lastly, I did a quick mini-review today, and they had to complete the quick check. 90% of my students got 5/6 or higher on it, so I was happy! We will keep working on these, but I'm happy with how they're doing so far. Here is a preview to this freebie and you can click here to download it for FREE from my TPT store. My next freebie is for idioms. We have been working on Figurative Language like crazy over here and my kiddos LOVE it! As a quick review, I read my favorite namesake to my students, Amelia Bedelia! We read Good Work, Amelia Bedelia and completed an Idiom worksheet to practice Idioms. You can pick up this for free here at my TPT store. Enjoy! I hope you all had a GREAT weekend. My hubby and I sure did! We had some pretty awesome purchases! 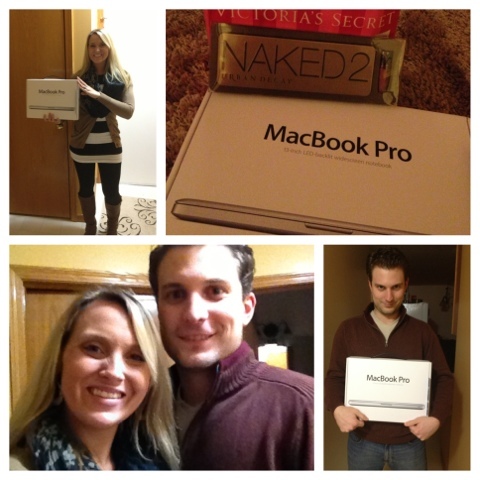 We got a new Macbook Pro----YIPPPEEE!!!!!!! I can't wait to create so many fun and cute teacher stuff on this amazing new machine :) And I picked up my new FAV make-up item.. NAKED 2 eyeshadow pallet by Urban Decay. SO worth the money (I usually don't spend much on make-up.) How was your weekend? Love to hear about all the Bloggers around the world and learn about each other's lives :) Later now! Just downloaded both of your freebies! I can't wait to use them! Thanks!! Thanks so much! Just found you from Manic Monday. Yay!